How did you come to live on Pawtuckaway Lake? The Crow family has been on the lake since 1928, the year I was born. My father bought his camp from Alice and Helen Gould of Raymond, as the deed says, in consideration of $1.00. But you need to remember it was only a fishing shack and it was built on rented land. Doc Fernald, from up on Nottingham Square, owned a lot of the land on what is now Rt. 156. His property stretched from Gove’s Grove, which is now White’s Grove, all the way up the lake almost to where the boat launch is now. This section of the lake was called Fernald’s Grove at the time. My parents rented the property from Doc Fernald for $10 a year. The lots weren’t marked out; people would just pick a spot, build a camp, and pay the yearly rent. The rent was only $10 a year for a long time. I remember the time Doc Fernald came around and told us the rent was going to have to go up to $15 a year. That must have been in the 1950’s because we had electricity by then. Later in the 1950’s Doc Fernald came by again and said that he was going to subdivide the land where our cabins were. He said, “You don’t have to buy the land but, you can. Either that or the rent is going up to $25 per year”. He was getting on in years and wanted to prepare his estate. He wanted to take care of everyone who had rented from him before he passed on. The price was so low that only one camper turned it down to my knowledge. This part of the lake was really the old colony; it was developed long before other parts of the lake were. During the peak development of the late 1950’s and early 1960’s this neighborhood didn’t change much. We watched that happen on other parts of the lake. This road was added to gradually over time heading back toward Fundy. The Fernalds would extend the road a little and sell a couple of lots. They did that every once in a while. The growth wasn’t sudden like other parts of the lake. 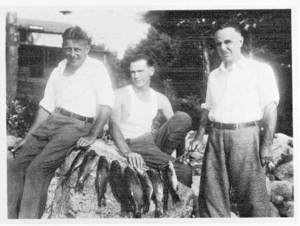 What attracted your family to Pawtuckaway Lake in the 1920’s? Dad had fishing buddies and they would go fishing on various lakes. A couple of them had cottages on other lakes and maybe one of them had a camp here, I don’t know for sure. They would go from one place to the other fishing. My father had a friend named Babcock, I think he may have had a camp up here. Dad worked for Lever Brothers down in Cambridge Mass., I think most of his buddies did. A kid doesn’t pay that much attention to those kinds of details. Lever Brothers made soaps called Lifebuoy, Lux, and Rinso. And, they also made a shortening called Spry. So, your family was from Boston? We were living in Somerville, Mass. when my father bought the camp, but eventually moved to Stoneham. I graduated from Stoneham High School. We came up to the camp on weekends and Dad’s vacations. My father had two weeks’ vacation every summer and then it got to be three weeks. We came up as long as we could travel. Nobody lived up here full-time back then. Some people, women particularly, would come up for the whole summer. We didn’t come up for the whole summer because my father worked all summer and my mother and I gardened. My father would help us with the garden when he got home from work. In those days you didn’t stray too far from your vegetable patch. Once it got to warm enough weather and past Memorial Day we came up every weekend. We’d drive up Friday night and go home on Sunday. Mother would be all packed up and ready to go when father got home from work. We’d eat supper and head out. We would come up Rt. 28 to Plaistow, then 107 through Fremont, and through downtown Raymond. It was bumpy and curvy. It took about two hours. Once you got to Haverhill it was gravel road from there on. Every year they would pave a little bit more. It took a long time before it was paved all the way to Nottingham. We’d get up to the lake about 9:00 pm on Friday night. It was dark but Dad and I would grab the canoe and go over to the ice house and break off a chunk of ice and throw it in the canoe. It only took us five minutes to paddle across to Gove’s Grove. We’d pay Fred Gove for it the next day. We used to cut ice out on the lake in the winter time and put it into storage in the sawdust pit. It was actually a house where the ice would be stacked up and the sawdust would be put in between the cakes. We used that ice all summer. Fred used to deliver ice by horse and buggy if you wanted it delivered. His wife Rose ran a little country store with a gas pump. It was one of those old gas pumps where you’d pump the gas up into a tube which would show how many gallons you were getting. It was 10 cents a gallon. I’d have a dime for gas and a dime for candy to last me the weekend. Mother thought it was a big effort coming up but that it was worth it. She was responsible for all the planning and to get the laundry done. One of the things that disturbed my mother was how often the camps were broken into. In the fall, she would pack up all the silverware, all the linen, all the sheets, and anything else of value. If she didn’t, they would all be stolen. If they left the camp in September and came back in October, there was a pretty good likelihood that anything and everything would be gone when they got back. We lost some collectable items, even tables. It was very discouraging for her. So, in the fall we packed everything up. What kind of car did your family first drive up to the lake? The first car that I can remember coming up in was a 1936 Packard, I can’t remember what we had before that; a Plymouth, I believe. There was a period of time during World War II that we couldn’t come up because of the gas shortages. You didn’t have enough gas coupons to go playing. What condition was Barderry Lane in back then? Barderry Lane wasn’t named yet, in fact, it was just a cow path. People just referred to this area as Fernald’s Grove. There were two gates coming into Fernald’s Grove to keep the cows out. Most of this area was grass land and the cows would graze out here. Up at the entrance to Barderry Lane that whole area was open grass lands. We’d often have to chase the cows out of the road. There was quite a bit of open land along Raymond Rd. at the time but, farming just phased out. It didn’t pay to let your cows run free anymore. People started keeping them close to home. You’d just turn off the main road and drive down the ruts. In the spring there would be two ruts from the tires running all the way down to the lake. Eventually, the ruts got so deep the cars would scrape bottom. We’d have to get all the neighbors together to hoe out the middle of the road. We usually only had to do that once a season unless we had a big wash out. There was one really rough place on this road; my wife Ellie remembers it because the first time I brought her up we got stuck in it. We had to lever our way out of it. The road isn’t much different today other than it’s twice as wide. You used to blow your horn coming into the road and keep blowing it as you drove down. You had to notify other people not to start in from the other end. There was only one set of ruts; there was no passing. If you met someone, someone had to back up all the way to the first turnoff. Doc Fernald used to come down here on his horse and buggy if you were sick. One time Dad spilled some boiling water on himself while on vacation. He had some severe burns. I don’t know how they got Doc Fernald but, I think Cecil Blake went out to get him and brought him back. We didn’t have electricity or phones. After he treated Dad he would come to check on him. He’d come down on his buggy; he liked to prance his horses down this road. I had acidosis one year; I got into the dogberries that I thought were blueberries. Oh, I was sick. He’d come down to check on me. He had an office in Raymond and another one in his home on Nottingham Square. What condition was Route 156 in? Before it became Route 156 the road was called Nottingham Road in Raymond and it was called Raymond Road in Nottingham. It was gravel, very narrow and twisty. A lot twistier than it is now; they had to do a lot of straightening. You will still see mailboxes that say Raymond Road on them. I graduated from High School in 1946 and came up here to spend the summer. I spent that summer up here working on the road. We paved from the Raymond town line through to Nottingham Square. I was working on the power saw cutting trees and I carried Nitro. One day I volunteered for the nitroglycerin packing job and it was really hot. I spent the next two days in bed with a Nitro headache. That stuff was terrible. I carried it and would drop the sticks down the holes. The next year I took off and wandered around the United States and ended up in the Army for almost six years. Did your family make improvements to the camp? 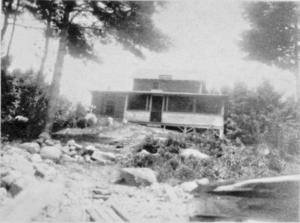 The original camp was referred to as “The Boulders”. In fact, the name on the original deed was “The Boulders”. My sister Lee Bartlett lives there now. My wife Ellie and I bought the camp next door from Olive Blake Kulp in 1990. When she lost her husband Bob, she decided to move. But, “The Boulders” was a one story camp when my father bought it in 1928. A few years later our next door neighbor Cecil Blake and Dad put the second story on, added another room that became the dining room, and put on a porch. My dad and I built a back bedroom, so that gave us two bedrooms. Besides that we had two beds upstairs and a crib. Around that time my folks passed away, young by today’s standards. So, with my sister Lee, we had two married couples with kids sharing the camp. There was really a lot of room. We screened in the two-sided porch so the kids slept out there. Actually, that’s where Lee and I slept while we were growing up. The kids always wanted to sleep on the porch. We have five children and Lee has two, so there were seven kids running around, plus the four adults. There was a dug well in a spring right next to the driveway. All of us on this side of the lake used that for drinking water. It had a hand pump on it. I filled that well in; those dug wells aren’t safe anymore. Everyone in the Grove has a drilled well now. There is still a little pump house by the side of our camp, it used to have an old Model T engine in it. The neighbors got together, put their skills together, and built a water tank up the rise here, a couple of hundred feet from the lake. They would fill that 1,500 gallon steel tank with lake water and play with the fire hoses. They would get old donations of fire hose; some of it would be OK, some of it had to be repaired. That was the fire protection for pretty much whatever we could reach with those hoses. I don’t think that thing would have put a fire out if we had one, though. You can still see the four cement posts that the tank sat on. I still don’t know how they got that huge tank up on the cement posts or down the road, for that matter. You sold your interest in the camp to your sister Lee? I was in the Army in 1951-1952; when I came back I enrolled in Northeastern University for engineering. I met Ellie, who was also in school in Boston, that same fall in 1953. I was too eager to show her the place and came up too soon in the spring. The frost had just gone out of the hollow. We really got stuck. Ellie was originally from Hampton. She didn’t really know about Pawtuckaway but, her father did. He lived in Raymond. He knew Pawtuckaway very well; he knew all the ponds around here. She was an ocean girl but, really loved being on the lake. When I first brought her here you couldn’t see the lake until you got right down to it. When we went around the last corner she thought this was the most beautiful thing she had ever seen. She fell in love with the place as soon as she saw it. After Ellie graduated from nursing school and I left Northeastern (because I realized I would be a lousy engineer), I went back to my previous occupation. From that point, we started coming up regularly. Then, in the 1960’s, we got really busy with our businesses back in Stratham and sold our half of the camp to my sister Lee. We built a swimming pool at our home, but our older kids were still mad about leaving the lake; they just about divorced us. So, there was a gap when we weren’t coming up that often. When I was growing up I had wanted to join the Boy Scouts but, we were at the lake every weekend. So, I wanted my kids to have an opportunity to belong to the Boy Scouts and 4H. All of these kinds of activities were done on Saturdays. I always wondered if I had missed something so I wanted my kids to have the choice of whether to participate in that or not. My three girls and two sons all belonged to 4H. I became a scout master for a while and Ellie was a 4H leader. And, we did dog shows. We had it in the back of minds to come back; well, the front of our minds, actually. In 1990, we made it back. Were there many camps on the north side of the lake in the 1930’s? Barderry Lane didn’t go as far as it does now. It ran down to Father Leddy’s camp, which was a couple of cottages past where the Robinsons are now. Down here in the Grove in the 1930’s there were about five camps; there were the Blakes, Middy and Minnie Proulx, the Thurstons, and the Reels. Beyond us, heading toward Fundy, there were the Ernsts, Father Leddy, Bertha Robinson’s, the Packards, and the Fernalds’ camp called “The Bluffs” which is still there. There was a camp up in back of Fundy, back up towards Round Pond Brook. The guy raised and trained hunting dogs. We could hear the dogs running at night. His place burned down and he didn’t rebuild it. They called that “The Dog Man’s Camp”. There is still a big fieldstone fireplace standing up back there and old car parts. There was a road that ran up back of Burnham’s Marsh, where the Fundy trail is now. That was Burnham Marsh Road. You could come down off of the Deerfield road and drive down through where the boat launch is and go over a little bridge. It’s amazing how you can wander around the deepest woods and you’ll find foundations and stone walls. There were also three camps on Great Island and one on Little Island. There were five more down by the Fundy boat ramp. They were squatters; they had no rights at all. The State came in around 1952 and tried to buy their camps from them but, nobody would sell. So, the State took the camps by eminent domain and kicked the people out and razed the cottages. The remnants are still down there in Fundy but on the islands you can’t find much of anything. I don’t know whose land that was; the State got control of it somehow. Logging companies had something to do with it, either they owned it or leased it from the power company, I don’t know. The power company owned most of it; they were the ones who built the dams. We knew the people who had cottages on Big Island and Little Island. Seeing them tear down those cottages and seeing our friends lose their places was traumatic. We felt that the State could have come to another arrangement; maybe they could have leased the land from the State the way they had leased from the power company. They didn’t give them the choice. They fought it in court, tooth and nail, but they lost when the State took it by eminent domain. There were mixed feelings about the State Park at that time. I know that the town of Nottingham felt like they were giving up something. On the other hand, we felt that it would protect the land from development. I think the general assessment from people here on the lake was that it was a good thing. The flip side of that was that our quiet, little unknown place was discovered. The lake became more widely used, especially the impact of a lot of people bringing in boats from outside the lake. When the Park first opened, they would not allow you to bring a boat in unless you were camping. Then they put the Fundy launch in and it has been pretty much uncontrolled ever since. That has been a long range impact. And, the State Park going in stopped the power company from draining the lake during the summer months. The power company drained the lake in the summertime? Actually, the lake association was started around 1935 when the residents started to fight the power company. I think it started on the South side of the lake first. There were a group of activists from the lake that were trying to get some control over the water level during the summer months. They felt that the power company had started taking the lake down too far. It was affecting fishing and wildlife. The power company eventually found an easier and cheaper way to generate the electricity than to maintain all of these dams and put up with the hue and cry of the people. They turned to other methods that were more predictable. They used to take about 16 feet of water out of the lake each year during the summer. They would start early June to draw the water down; by the end of July we would be walking around in the mud. You would have to keep moving your boats further and further out to keep them in the water. Over in Dolloff Pond, the south side of the lake, you didn’t even have 16 feet of water to start with. So, by mid-summer all you had was a trickle from the Pawtuckaway Pond, the north side, into the Dolloff Pond side. Pawtuckaway Pond ran from deep water to mud flats up by the twin islands. By the time they’d taken 6 feet of water out, the flats by the twin islands would be exposed. When they took 16 feet of water out, there would be two streams coming into the pond and one going out where the north dam is. Once they drained it they left the boards out until spring, so it stayed drained all fall too. There was one spot on the north side that was 60 feet deep. Today the deepest place they can find is about 40 feet deep. The water level always started off in the spring as high as it is now but, you take 16 feet of water out and you don’t have a whole lot left. You do have a lot of shoreline though. When the water was down people would come in with bulldozers and carve out their beaches. The islands on Dolloff Pond only had brush on them when I was a kid. Today there are trees, 70-90 year old trees; they were just bushes then. All of the islands on the south side of the lake were pushed up by a bulldozer, that’s why they are just jumbled up boulders. They deepened the pond to create more water storage; the power company did that. They wanted more water available to generate power down in Newmarket. They did that right around 1920 after they bought the land and water rights from Newmarket Manufacturing Company. I don’t think there is an island on that side of the lake with a tree that is 100 years old on it. Tom Badger was one of Dad’s friends; he had a camp over on Bow Lake. Bow Lake was part of the same electrical package; they lost their water in the summer as well. There was a whole system of lakes, Nottingham Lake, Onway Lake, Governer’s Lake, any lake that flowed into the Lamprey. What did you do for fun as a boy? Every time we came up I would go to Gove’s store. It was the greatest thing on Saturday morning to hike up through the Grove to the store to stock up on gasoline and penny candy. By walking along the shore and going to the store, we knew everyone on the lake. We’d stop along the way and play with the other kids. The Thurstons had twins. My older sister, who lives in Tennessee now, was friends with the Thurston twins. Everybody called them “Brother and Sister”, I don’t even remember their actual names. We used to play in Fred Gove’s barn, too. We’d help him hay and play up in his hay loft. I had a rowboat and later I had a motor for it. I also had a canoe. We did a lot of exploring. I knew all of Fundy and all of Dolloff Pond. I canoed mostly. We had outboard motors starting in the early 1940’s. I had a 7 ½ hp Evinrude that was built for salt water; it was all bronze. It took dad and I to put it on the boat it was so heavy. We had a dory, a tight lap strake dory that two people could row. We had more fun with two kids rowing at the same time. Then dad got the motor. I had 10 cents to buy a gallon of gas each week. I’d make that last all weekend. We used to cranberry back in Burnham’s Marsh. When they would drain the water you could go back and pick the cranberries; they were beautiful cranberries. We would virtually fill the canoe with them. Then the State built a berm on either end of the Marsh to keep the water level up for the wildlife, which killed the cranberries. There are still good blueberries back there but they are hard to get to. We had some neighborhood cookouts, no fancy entertainment. In the early years people used the lake for recreation. There were some card parties. In the evening the kids played a lot of games. We played a card game named “Flinch”. We played “Sardines” a lot. You’d send one kid out to hide, give them 10 minutes to get hidden. The other kids would then head out to try to find them. You didn’t hunt in a pack, everyone had to go their separate ways. There weren’t any flashlights so you had to feel your way through the woods. When you found the person, you crawled into their hiding spot with them, that’s why they called it Sardines. The last person to find them had to hide the next time. You could be there awhile swatting mosquitoes. It usually lasted about two turns before kids started to sneak into their houses and leave someone out there. About 1956, right after Ellie and I got married, Don Holden who had the seaplane also got a little Yellow Jacket runabout. I think he had a 25hp motor on it. He taught everybody on this side of the lake how to water ski. 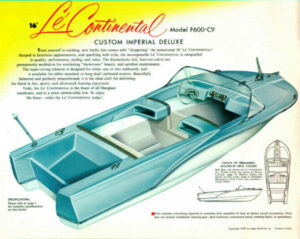 In 1960 my brother-in-law and I built a fiberglass ski boat, a Luger. It was 16 feet long with a 40 hp Evinrude motor on it. We skied all the time, we had a ball. It was a kit, it “goes together in one enjoyable evening”, at least that is what the ad said. It was more like six months of hard work and one enjoyable evening! We put it together in my barn over in Stratham during the winter. It was tough working with fiberglass during the winter. When I was a kid we would spend all of our time out on the water playing, fishing, and skiing. By the time my kids were mid-teens we wouldn’t take them skiing on the lake on weekends because it was too dangerous. There were too many day trippers boating. If you have a young skier fall because they are still a novice there are too many boats on top of each other to feel safe. The development of Fundy boat launch, the parking lot, the paving, the bathrooms, have created a whole lot of new usage. It has increased boating, hiking, and hunting. It was interesting in the 1970’s during the Arab oil embargo. All of the boating activity dropped off substantially. That’s when sailboats really became popular on the lake. Before that you didn’t really see sailboats here. Back in the 1940’s there were three or four ice boats on the lake. They were something to watch, they go really fast. They didn’t last very long. I guess that’s because we haven’t had too many years of open ice. Once you get snow on the ice the ice boats don’t go very well. What was the most significant event that happened on the lake? Around 1940 a Boy Scout camp in Gove’s Grove burned down. They couldn’t save it. There was another troop that had a Boy Scout camp back behind us on our road. That had started to fall apart, was vandalized, and it sat idle for a long time. The Morels fixed it up and used it for a summer cottage until they were able to buy the Proulx camp which they took down and built a year round home. My sister was here when the twister hit in the early 1950’s but it missed us. It did blow through White’s Grove. I remember walking over there; there were some trees on cars and other damage. A couple of the little islands on the Dolloff side were damaged. You could see the zigzag path the twister took because of how the trees were knocked down on those islands. The little cottage with the attached boat house at the entrance to Mountain Brook Cove had its roof blown off, too. The roof was lifted off of the house and it landed in the trees on the little island across from the house. She went over in her rowboat to see the damage. What wildlife have you seen on the lake? Up around the back side of Big Island I saw a family of eight otters early one hunting season. I was walking up Burnham Marsh Road, now called the Fundy Trail. I heard them hit the water on the other side. They played and roiled and just had a ball back there. They had a mud bank they were sliding down. I’ve always hunted back on Big Island; I’ve been a deer hunter since 1956. Two of the last three deer I have taken I got back there. I’m the only hunter in the family. I take that back, my youngest daughter is a hunter, she lives in Maine. They used to hunt woodcock back there. Pheasant requires some open spaces but, there was a lot more open space back in the park back then. There was a farm back there with beautiful blueberry bushes. I haven’t been able to find where it was, it’s all overgrown. I remember the farmer chasing us off his land one day! The fishing has changed. We don’t have hornpout anymore. We went out at night. We had a kerosene bull’s-eye lantern that we would set on the edge of the boat on an oar. The illumination would draw the hornpout to the boat. They feed on the bottom. You used hand lines instead of rods. You would just bounce the line off the bottom until an eel crawled up your arm! That would be the end of that for the night. Mr. Coburn and his two sons would take a case of beer or two and go fishing for hornpout. They would come in around dawn with a boat full. They’d sleep off the beer and go clean fish. I’d rather eat hornpout than trout. We’d find them down by the Twin Islands, which was the best spot for us. I think the hornpout are gone because the bottom of the lake has changed. There is a lot more silt than there ever was. A few winters ago someone lost a brand new snowmobile through the ice at the deep part of the lake. They sent divers down and never found the machine. It just disappeared into the silt. There was a stone wall in South Channel. 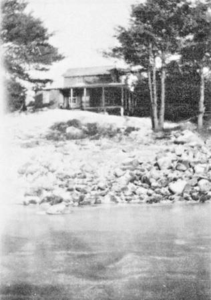 It ran from Horse Island across to where the camp “Calitaday” is (now gone—ed.). When they used to drain the lake in the summer the water would get trapped behind that wall. We’d go over there and pull pickerel out of the water by hand with nets. We had mostly small mouth bass in the early years. The large mouth bass didn’t come until they began stocking the lake with them. There were yellow and white perch. There were a lot of white perch then; we don’t have many white perch today. We have black crappie now, which is new. The ice fishermen are mostly fishing for black crappie. Of course, we have sunfish. We didn’t used to have bass boats roaring up the lake at 4 to 5 o’clock in the morning. They gather up by the twin islands and at 7:00 AM, I don’t think they fire a gun but, they come roaring down the lake. It’s like a huge wave. We didn’t see loons for several years. I remember them as a kid. My mother used to complain, she’d get up at night to use the outhouse down around the hill, about 50 yards from the house. She’d say, “Those darned loons, they know when I’d go to the bathroom. They laugh at me all the way to the outhouse”. And, I don’t remember seeing cormorants in the lake until just a few years ago. We don’t see blood suckers anymore, either. We used to have blood suckers on our beach. I remember having them peeled off of me. We used to collect them in jars and put a little salt in there. They would writhe and turn themselves inside out. I got one two years ago picking blueberries but, it was small. They used to be really big. How has the lake changed over the years? More people and better roads. Fortunately, you can’t see the lake from the road. That would have made it even more crowded. But, people are finding the lake more and more. 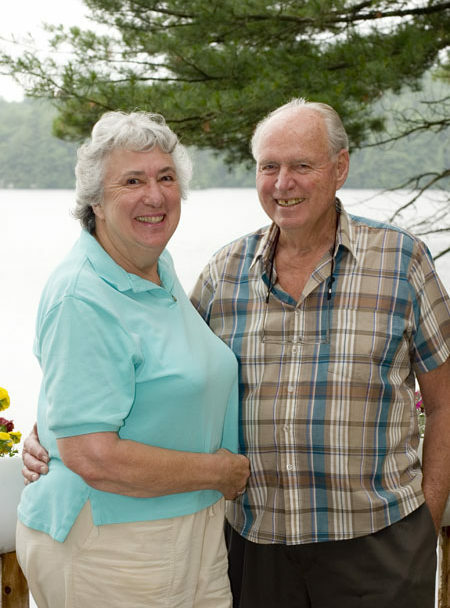 We are very fortunate on this side of the lake that the Fernald family hasn’t decided to sell all of their land along the lake. Of course, someday they will. Also, having more year round people has been a positive development. You get a much better quality of house, better upkeep of the shore land, and septic systems that have to be improved. Water quality has improved a lot since they started keeping the water level of the lake up. When they drained the lake so dramatically it really riled the water up. I’m not sure if we are seeing more algae now or back then. Also, people improving their septic systems have made a big difference. Algae is such a strange thing, you’ll see it one year and then you won’t see it for several years. Especially blue/green algae. You can even see it one hour and not the next. What do you see as a major challenge for the community in the future? The Lake Host program has certainly helped prevent the infestation of exotic plants. That’s a continuing threat that we haven’t had to face yet. There are striped zebra clams and a few other species that are dangerous. As long as you have outside boats coming onto the lake it’s a continuing threat. They ought to gate the boat landing until someone is available to check the boats for exotic species. They should limit the number of boats that they allow to put in at that landing, it’s not controlled now.